Éva TARDOS de Cornell University ( http://www.cs.cornell.edu/~eva/ ) est lauréate de la 3e édition du Prix Jean Kuntzmann, décerné par le labex PERSYVAL-Lab, le pôle MSTIC de l'UGA et Inria Grenoble Rhône Alpes.
" Learning in games "
qu'Éva Tardos nous fera l’honneur de présenter. Merci au Musée de Grenoble de nous accueillir pour cette occasion. Algorithmic Game Theory combines algorithmic thinking with game-theoretic, or more generally, economic concepts. The short course will discuss mathematical techniques at the interface between algorithms and game theory developed over the last decade for quantifying the inefficiency caused by selfish behavior both at Nash equilibria, as well as in outcome of learning behavior. For learning outcomes, we will focus also on what are good learning methods in the context of interacting selfish agents. We will consider their applications to markets, auctions, networks, as well as the Internet. No prior knowledge if game theory is assumed. 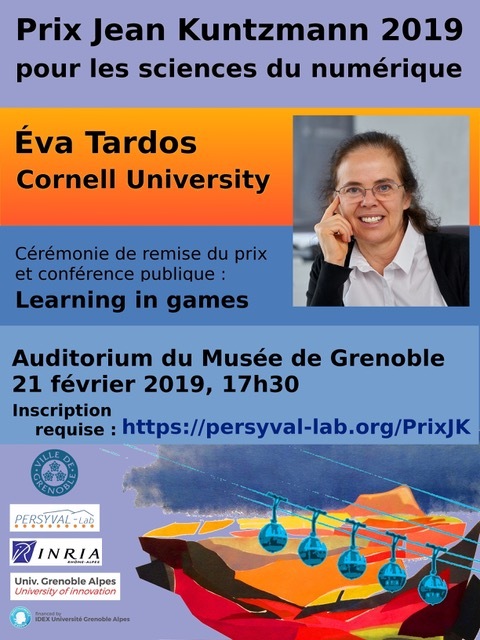 Éva TARDOS est Professeur d'informatique à Cornell University. Ses thèmes de recherche sont larges (algorithmes, optimisation, apprentissage, théorie des jeux, graphes, applications aux sciences sociales et à l'économie). Éva Tardos is Jacob Gould Schurman Professor of Computer Science at Cornell University. She was trained in Hungary, and received her PhD in 1984 from Eötvös University in Budapest under the supervision of András Frank. She joined the faculty in Cornell in 1989. Her research concerns algorithmic game theory and the development of efficient algorithms to solve problems such as optimization of traffic routing performance in large-scale communications networks. She studies design systems used by diverse and self-interested users, such as the Web, social networks or financial markets. In particular, she analyses the outcomes of selfish behavior in such complex systems, quantifying the efficiency loss due to the selfish behavior of the participants, and designing systems where selfish behavior results in close to optimal outcomes. Prof. Tardos has supervised 18 PhD students. Former editor in chief of SIAM Journal of Computing 2003-09, she is currently the editor of the Journal of the ACM and the editor of Combinatorica, among others. She has been distinguished with several awards, including the Gödel Prize, the Dantzig Prize and the Fulkerson Prize. She is a member to the National Academy of Engineering, of the National Academy of Sciences and of American Academy of Arts and Sciences. Prof. Tardos gave the Association for Women in Mathematics/SIAM Sonia Kovalevsky Lecture in 2018.